Byju’s classes are the pioneer in Interactive learning. Founded by Byju Raveendran (serial CAT scorer), with the aim to change the present middling education process. Byju’s classes with the intention of making the learning process easier has introduced E-learning which is adaptive, can be studies anytime-anywhere at one’s own pace. Technology is omnipresent in our lives, then why not inculcate it in our education system? Giving the best training to the students is our goal. Being in the visual era, images play the key to engage students. Still images have been included in learning/study materials for decades. Now, with faster broadband, cellular networks and high resolution screens, it is possible to include quality images and videos to be a part of e-learning. Furthermore, this effect increases over time. Another study found that after three days, a user retained only 10-20 percent of written or spoken information but almost 65 percent of visual information. Pairing concepts with meaningful images ensure that the learners store information in their long term memory. Research has found that, visual learning increases better recall than when courses deliver information through textual or aural form. Visuals have the power to make students sense out the content and direct attention increasing the possibilities that the learners will remember. Consider an instance. If Geometry is taught to a student, a textual description of a circle is- ‘Round plane figure whose boundary (circumference) consists of points equidistant from a fixed point (centre)’. But if we consider the graphic representation, it is easier of students to remember. E-learning helps to stimulate imagination and improves cognitive level enabling students to process the information faster. It also helps in improving reading comprehension, student achievement, organizing and communicating ideas. Around 40 percent of learners respond better to visual information. Seeing a video allows the user to recreate the experience. With compelling videos, it is easy to teach the students. With our learning app, a student has the freedom to study anytime-anywhere at one’s own pace. A student need not worry about attending physical class sessions. Lectures through videos and other study materials are sent to the student through a SD card, which is compatible with an android device. The students can see the videos, learn and complete the assignments. Students need not have to fight traffic or rush to attend coaching institutes. Learning from the app, gives an opportunity for a student to plan the study when they are at their peak energy; whether that is early morning or late at night. With easy access to study materials, a student need not schedule a trip to library either. In coaching institutes, you can never be sure of the quality of the faculty. A student gets a chance to take a demo class, yet there is no guarantee that the same teacher/mentor might be taking all you classes. It is also possible that the faculty provided by coaching institute is not of high standard and students fall for the brand name. On the other hand, with Byju’s learning app our faculty is consistent with their teaching students do not experience variation in the teaching and get only the best. Students can either come to our coaching center or call the mentors to clear their doubt. A student is free to contact the mentor 24/7 either through a phone call or a video call or by simply sending a message or an email. Our mentors not only help the students academically but also help the students emotionally by counseling them. Learning app is a more affordable option than traditional coaching institute. A student can save on the commuting cost and study materials. With an android device a student is all set to study anytime-anywhere. How to get Byju’s learning app? Someone from Byju’s will get in touch with you and if interested will send you a SD card which is preloaded with videos and study materials. We have a money-back policy, where in if a student does not find our training interesting, within 7 days the SD card can be returned and avail the fee paid. 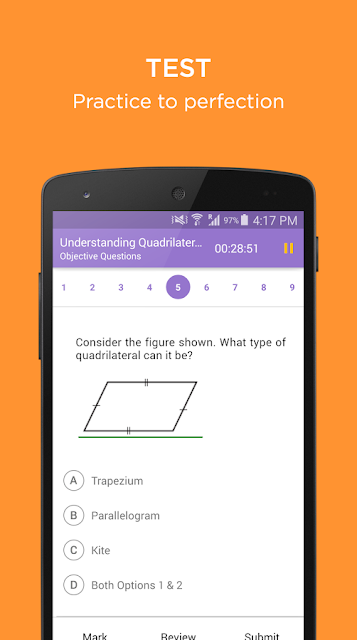 Thus, our learning app provides everything that is required for a student to study efficiently. To reiterate, e learning is an easier, cheaper and a far more effective manner to study. With Byju’s learning app, fall in love with learning.